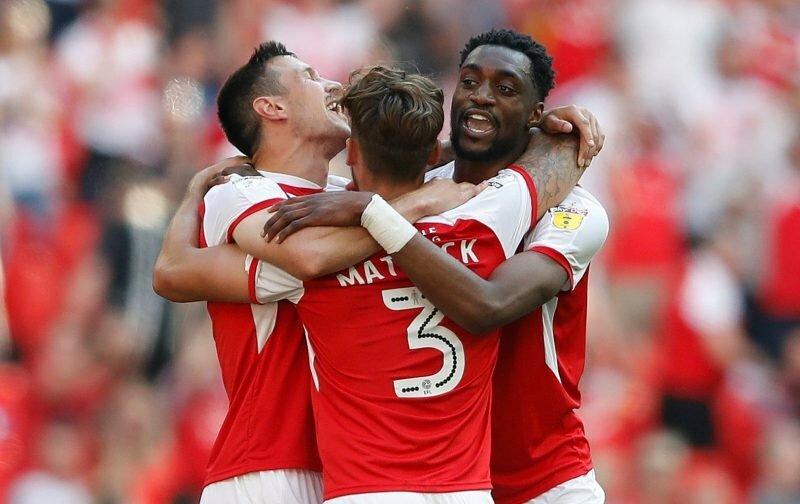 Rotherham United gained a much needed three points yesterday at the New York Stadium, their first since New Years Day, against a Blackburn Rovers side who themselves hadn’t won since the end of January. The Millers came out fighting and the game was only two minutes old when a long throw from skipper Will Vaulks flew into the penalty area finding the head of Semi Ajayi who rose above everyone else and opened the scoring for the hosts. Rovers looked visibly shaken by the early goal and a Richie Towell free-kick minutes later saw Clark Robertson head on at the far post but out came Rovers’ ‘keeper David Raya to claim followed by some poor defending allowing Vaulks to get a shot away which went inches past the upright. A late challenge on Vaulks saw former Miller Richie Smallwood get the first yellow card of the afternoon. After Amari’i Bell got past his marker Billy Jones had to be on his toes to get the ball to safety with the resulting corner coming to nothing. Rovers perhaps should have done better from a Charlie Mulgrew free-kick which fell to Jack Rodwell but Millers’ ‘keeper Marek Rodak did well to claim the ball. Anthony Forde took the ball away from Ryan Nyambe who then pulled the Millers winger back with the following Forde free-kick finding the head of Vaulks whose header flew over the bar. The next person to collect a yellow card was Robertson for a tug on Bradley Dack before Raya was back in action when he did well to clear before Forde could get to the ball. As half-time approached Rovers got a bit of momentum going with Michael Ihiekwe doing well to get to a ball before Danny Graham followed by Jones blocking a Bell shot at goal before the Millers defender took the ball off Dack before he had a chance to shoot. At the other end another long Vaulks throw fell to Richie Towell who shot wide with the last action of the first forty-five seeing the Millers defence clear a Mulgrew free-kick. Both teams made substitutions for the second half, Ryan Williams replacing Anthony Forde for the Millers and Joe Rothwell coming on for Richie Smallwood for the visitors. Rovers started the better and Marek Rodak was a bit at sea when a Charlie Mulgrew corner hit the inside of the post before it rolled to safety. Five minutes in saw Joe Mattock booked for a poor challenge on Ryan Nyambe with the resulting Mulgrew free-kick finding Amari’i Bell who volleyed into the top of the net to make it one-one. At the other end David Raya did well to get down to a shot from Michael Smith followed by Richie Towell making way for Ben Wiles. And it was the young Rotherham sub who was in the thick of the action on fifty-eight minutes with him moving the ball forward at pace finding Vaulks who in turn found Smith who headed down to Williams for the Australian to get in front of Raya and putting the ball into the net for the |Millers to re-take the lead. Rovers went straight down the other end where a lovely cross from Elliott Bennett found Danny Graham but, under pressure from Billy Jones, couldn’t direct his header at goal before Bradley Dack saw a shot go just wide of goal. Michael Ihiekwe did well to put a dangerous looking ball behind with the following corner punched clear by Rodak. A free-kick was easily saved by Rodak before a Rothwell shot fizzed past the post with the Millers shot-stopper scrambling across his goal. With ten minutes to go Jon Taylor, after treatment on the pitch, was replaced by Matt Crooks which was followed by Rovers taking off Adam Armstrong for Joe Nuttall. After Millers Boss Paul Warne came out of his dugout to get the fans singing Wiles won a corner which he took himself and went out for a throw-in off a Rovers defender. Will Vaulks threw the ball in playing a one-two with Wiles and then the Millers skipper sent the ball high into the penalty area and there was Semi Ajayi to meet it and get his second and Rotherham’s third of the afternoon sending the eight thousand Millers fans barmy. Minutes later Wiles tried his luck from thirty yards out seeing the ball go into the singing Rotherham fans behind the goal. At the other end both Robertson and Rodak did well to stop Rovers getting shots at goal before deep into stoppage time a shot from Dack hit the post and was coming out towards Graham who Michael Ihiekwe tripped up and referee Brooks had no option but book the Millers player and give the spot-kick which Mulgrew scored from making it three-two. The last action of the day was the final substitution for Rovers which saw Harrison Reed replaces Elliott Bennett. A well deserved three points for the Millers yesterday, although they made us sweat towards the end didn’t they! Stranger things have happened, CinL! It was great to get those three points – my heart was in my mouth for those final couple of minutes but we hung on! Yes, Ipswich just didn’t try!